Cheney pulled Mississippi power workers away from their work restoring electricity to hospitals that had been dark for several days, delaying the return of power to those facilities for 24 hours. The workers weren't told until after they'd worked sixteen straight hours that they were making the world safe for Big Oil and risking their lives to help out Cheney's cronies at Colonial Pipeline Company. Everything about the work was dangerous, their foreman said, likening the job to chainsawing wood in the dark with a flashlight. Given that the job was decorated with broken power lines, flaming tree branches, and floodwaters, it's a tribute to their skill they succeeded. I can understand Cheney's alarm, and why he felt it was a national emergency. He is very identified with the flow of oil. Having had a quadruple bypass, he knows that continuous, uninterrupted fluid flow is the way to health and survival. He personally identifies with the oil infrastructure almost as if the pipelines were his own veins, and the flow of oil his blood. See illustration below. Shortly after Hurricane Katrina roared through South Mississippi knocking out electricity and communication systems, the White House ordered power restored to a pipeline that sends fuel to the Northeast. That order - to restart two power substations in Collins that serve Colonial Pipeline Co. - delayed efforts by at least 24 hours to restore power to two rural hospitals and a number of water systems in the Pine Belt. Desmond Dekker's "Israelites" is one of my favorite songs going back to my youth. The song has been haunting me, as I work on my essay about the New Orleans diaspora, that I've decided to call "The New Israelites." I downloaded the song from eMusic.com, that seems to have a very nice system and some good tracks among the 600,000 they advertise. Here's the lyrics and the tune in mp3 format, plus an image of a beautiful Ethiopian girl who will cheer you with her smile. The TRJ-89 can be easily towed behind most vehicles, is electrically self sufficient, and has a maximum jamming radius of up to five miles. According to Wayne Madsen, ham radio operators said communications of specific frequencies were intentionally jammed during the flooding of New Orleans from an “intermittent frequency jammer operating south-southwest of New Orleans aboard a U.S. Navy ship. A former Department of Defense source says the U.S. Army uses a portable jammer known as Warlock in Iraq, and the jammer may be similar to the one that is jamming the emergency frequencies.” Whether Madsen is right about the cause of all the cell phone dysfunction in the New Orleans area is difficult to know, unless more disclosures occur. What we do know is that on August 29, 2005, Howard Melamed, CEO of CellAntenna Corp. of Coral Springs, Florida, urged Congress to change the law and let not only the federal government, but also state, county and city law enforcement, buy CellAntenna’s cell phone jammers. In Europe and elsewhere, in fact, small jammers are becoming ubiquitous. They’re in the Greek subways, Mexican churches, Indian temples, and Tokyo theaters and commuter trains. 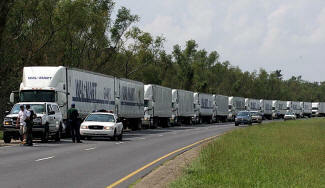 Could one have been deployed by FEMA and the military in New Orleans? Well, duh. But why would they? Given what we know they did – standing around watching people die while sitting on a mountain of supplies – you’d just have to answer, “Why not?"